Basile is fast becoming one of the hottest comedy acts in the country...a deranged blend of wild, silly, and outrageously funny characters, voices, and attitudes. A powerfully diverse entertainer, he is able to shift from frenzied airline passenger to tearful teddy bear to angry, antagonistic performer without missing a beat. Watching him in action is like opening a big beautifully-wrapped gift...you have no idea what"s inside, but you know it"s going to be good! 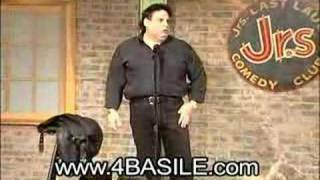 Basile"s career has taken him from film to radio (Four-time ADDY Winner, the James Brown/OJ Simpson Trial Updates syndicated), to commercials (Moosehead Beer), to TV (A&E"s Evening At The Improv, Comedy On The Road, Caroline"s Comedy Hour, Comedy Central, Showtime"s Comedy Club Network, MTV Half-Hour Comedy Hour), to writing (US Air"s Entertainer Magazine, Greek American magazine). He lends his voice to Universal Studios as Bullwinkle J. Moose, and Japanese Anime on such series as Bubble Gum Crash Crisis and UY/Urusci Yatsura, and the list goes on and on. His powerful performances have made him one of the most sought-after stand-ups on the comedy circuit today...unique and unpredictable, but always hysterical. He fills the envelope, and pushes it far beyond all previous limits. There"s never been anyone like Basile... There Couldn"t Be! Intense... Untamed... simply put, UNLEASHED!